With photography, everything is in the eye and these days I feel young photographers are missing the point a bit. People always ask about cameras but it doesn't matter what camera you have. You can have the most modern camera in the world but if you don't have an eye, the camera is worthless. Young people know more about modern cameras and lighting than I do. When I started out in photography I didn't own an exposure meter - I couldn't , they didn't exist! I had to guess. Alfred Eisenstaedt, in «LensWork», Feb-Mar 2002, p. 80. It is not possible to think of Photography in terms of adjectives: as much for its intimate constitution as for the impossibility of containing it. It is this very essence of irreducibility, of defiance of categorisation, that inevitably makes Photography rise above any mediocrity which, periodically, the whims and trends of the day try to saddle it with. Adjectives come and go, Photography stays. Like the Renaissance ideal of Man both at the centre and measure of the universe, so the universe of Photography cannot lose its centrality. And the very fulcrum of this centrality is the eye that sees - not the equipment which is used by it. To not understand this, or, worse, not want to understand this, signifies relegating oneself in a ghetto of hypocrisy. To be sure it is a ghetto of enormous, global, technological proportions - but a ghetto nonetheless. So, if someone is searching for a revolution, they should use their eye - if they can. That would be truly revolutionary. Conversely, it would be like listening to the of Valentyn Sylvestrov's Mysterium without any kind of ears. 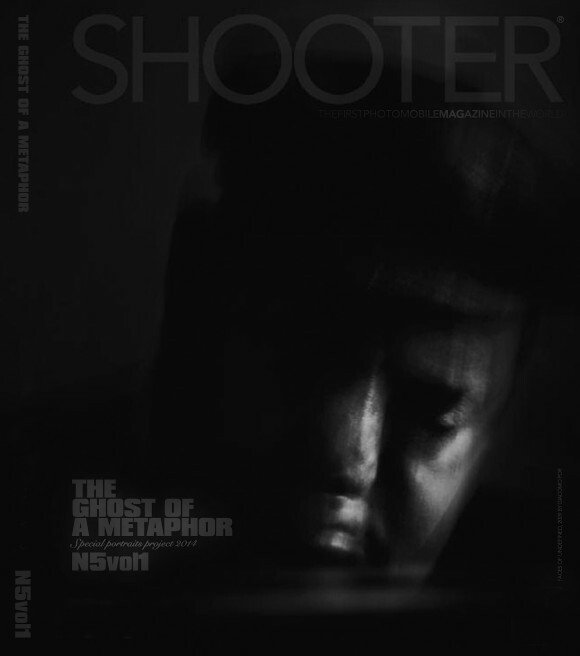 In this special edition of Shooter which focuses on the portrait, and which I have had the immense pleasure of working on as guest editor, I thought it would be both interesting - as well as irrefutably necessary - to highlight the centrality of Photography. More and more often, in fact, when examining a photographic work, attention is given to how it has been realised technically rather than what it is about. It is time to bring the attention back to what a photograph is, rather than how it has been realised. It is both essential and a matter of urgency to reflect on the what, rather than the how. Being able to do that would be truly revolutionary. Reuniting artists - both amateurs and professionals - from a wide spectrum of backgrounds, without imposing any limit whatsoever on the technical aspects, but focusing only on the intrinsic quality of their work, seemed to me from the very beginning the best way forward. Hence film and processors, mobile phones and medium formats, tablets and DSLRs - all have been gathered with neither distinction nor prejudice. The what, not the how. Famous artists and unknown ones, photographers at the very beginning of their photographic journey and photographers who have come to the end of theirs (and are hence being published posthumously) - I thank all of them indistinctly for their work and the fact that they are here, in this edition of Shooter. They have all been placed on the same line of force. All of them. All of them in the same conditions. With just one prerequisite: putting Photography first. Bringing it back to its rightful centre. In the words of Frank Horvat, «Photography is the art of not pushing the button». The what, much more than the how. Not an exhibition, therefore. Not a series, not a juxtaposition, not a mosaic. But an imagining, a liberating, a relinquishing of visions orchestrated with a sole intent and a multitude of hope. Rather than one exposition a kaleidoscope of big and small tautologies which merge into one multiple, yet fluid, vision. Like a word which does not express a particular thought, but evokes a deep sound of unknown origin and uncertain outcome. A curious reversal of Thomas Edison's Kinetograph. Everything can be portrayed, but not everything is a portrait. By the same token - and going beyond the boundaries of meaning - we can come to the conclusion that all of Photography is a suggestion and a re-creation of the portrait. As such, it becomes rather simple to imagine how the overcoming of the concept of Photography cannot but inescapably take place by first reversing the very concept of what constitutes a portrait. No longer intended as simple genre, as convenient term doled out to fill in a maieutic chasm of emptiness, but as definitive metaphor of all of Photography. A metaphor which is constantly lateral: which exists in a continual transformation of senses and meanings and which re-creates itself in a perpetual motion of conceptual shifts. A metaphor which dies every time so as to re-invent itself anew: intuition of that which cannot be articulated. And so, retracing itself back to its origin, becomes a ghost. A ghost which traverses genres and execution, intelligence and vacuousness; which subtends and anticipates every creative movement, travelling through time and space. And it is this ghost of a metaphor which transits through every portrait, which moves the forces of a necessary heterogeneousness without which it would be impossible to even postulate the existence of Photography. And so it is that here we witness the albinos portrayed by Gustavo Lacerda finding their cinematic correlation in the still streets portrayed by Julie Wolsztynski-Reynes. Portraits of a body are part of an expressive possibility never enough revealed: what is a naked body if not the synthesis of the complexity of a naked face? And a naked body, of which the face is part, can at times foresee a gaze which otherwise would not exist - as in the absences of Ines Laimins or in the satisfied and silent solitudes of Carolina Mateu. The opposite expressionisms of Andrea Fenu, David Brookner and Plume Heters are held together with almost surreal, and certainly surprising, outcomes. The traced and suspended childhood of Barbara Ungaro. The invisible conflicts of Laleh Shahmohamadinejad. The minimal variations of zezn. The meditative counterpoints of Taly Mizrahi. The realism - a possible realism - of Pachi Tamer encounters the dreamlike and tragically ironic force of the underdogs. The same, though in polar opposite, in the celebrities portrayed by David Barry. The imaginative impetus of Vee Speers, with her delicate mythology, dovetails into the opalescent obliquities of the faces of Emmanuel «Chivo» Lubezki. The imposing human framework of the unseen, seen and revealed thanks to the courage of Juan Obiols Vie. These are but some of the elements found in the line of force of this special edition of Shooter. The others can be discovered with the patience and the courage of curiosity. It follows that a portrait is not the equivalent of an identity card, or a passport. An individual is more than the sum of his or her facial geometries and one does not take a portrait to establish something or someone as a fact. Not even documentary photography or photo-reportage have as their objective the aim of documenting something as a fact. Rather, they aim at providing a key with which to read reality and portraits are a perfect example of this. When we take a portrait we are taking a person's likeness yet we are modifying it at the same time, for it is through our vision that their facial features are being expressed (the way we choose to light their face, the moment we choose to click the shutter, where we stand in relation to the person being portrayed). In this sense, the 'falsehood' of portraiture saves us from the narrow trap of identity. This gathering, therefore, does not foresee a path, a hierarchy, an order. There is no before or after, there is no above or below. There are no perceptive suggestions, there is no guide. Instead, it is the reader who will direct his or her attention to wherever they want, each time differently. Photography, with its dual nature of truth and sublime falsehood, does not need attitude; nor does it need the hypocrisy found with increasing frequency today - so redundant and ridiculous. Photography and the portrait are useless precisely in the measure that they are so vitally necessary to us all.